I’ve been on a maroon-and-gold kick lately. I plucked out two skeins from my stash intending to knit a hat. Once I sat down and cast on, I found myself knitting socks instead. I knew I wanted some kind of stripes, but I couldn’t decide: thin stripes or thick stripes? Inspiration struck when I finished the cuffs and changed to the gold yarn. I alternated the stitch for each contrast round. I like how it looks, almost slouchy. The purl stripes add textural and visual interest. I decided to leave the insteps plain, because I didn’t wait to continue the stripes without the texture, and I didn’t want purl rows inside my shoes. I didn’t notice a problem until after I had already taken this picture. Do you see it? 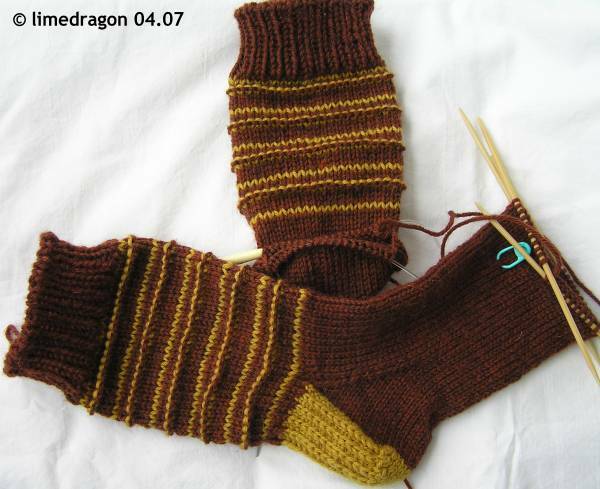 The number of stripe repeats on the legs? Apparently I cannot count. I thought there were four and knit the second leg accordingly. No problem! I have a plan! Does your maroon & gold kick have anything to do with being a Harry Potter fan? I like the way your mad cow socks are turning out. I wouldn’t have noticed if you hadn’t pointed it out! No one would notice unless you tell them dear. Hm… those brown and yellow kind of represent Harry Potter kind of fashion. That is so something I would do! The stripes are really cool. I like the mad cow socks, especially the mirroring. Hmmm… I am also very curious what the plan is…. I love the maroon and gold combination. Gorgeous! I love the mad cows :) Great name!